There is something so very comforting about a lovingly made cup of tea. And with huge gratitude to our amazing, dedicated retreats hosts and assistants, at Casa Lakshmi Luz you can enjoy fresh herbal teas from morning through to night. Many of our guests are detoxing from caffeine and needing to soothe their nervous systems, so we include teas that give you a natural positive uplift yet have many more healing and nourishing qualities. We love to serve freshly picked infusions of rosemary, foraged straight from the surrounding fields at Casa Lakshmi Luz. Or to spice up your morning and strengthen your system, try stem ginger and healing turmeric locally grown and purchased next door, from Can Muson organic farm. 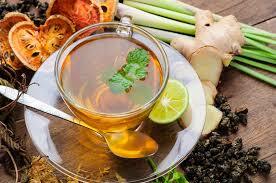 The herbal teas we serve morning-to-night are purchased or found growing no more than 500 metres from Casa Lakshmi Luz. When plucked outside the door (or from our emerging herb garden!) there is something that you can taste that is just so fresh and so pure. Here are our top 5 teas of 2016 come and join us and let your taste buds explore! Rosemary – Growing all over the island, this beautifully scented herb tones organs and purifies your system. A natural awakener, it has been proven to enhance your memory and to clarify your mind. Best enjoyed with fresh lemon from our trees and a cheeky dollop of locally farmed honey. Turmeric – contains a yellow active compound called curcumin. It’s curative qualities are many and include:being an anti-inflammatory agent, helping to heal the gut, can be used to treat menstrual cramps and supports the growth of good bacteria (known as probiotics) so perfect for boosting your digestive health and is great for improving your immune system. We also love a spoonful of the powder in raw honey for sore throats and to pre-empt the onset of colds, enhanced with black pepper. Hierba Luisa – also known as Lemon Verbana, calms and tones the nervous system, enhances your immune system and its’ fragrance alone uplifts the senses and helps you feel the sun shine from the inside. Fresh mint (with optional lemon) is just super for cooling your system (and your mind) and aiding your emotional and physical digestion. We love a cold mint tea served with a slice of lemon and cucumber during our sizzling summer months too! Ginger root tea – boiled in water to release its’ potent, spicy qualities, ginger gets your inner-fire going and in Ayurvedic medicine, is seen as just that: a true medicine root. It is a brilliant alternative to caffeinated drinks and a warming fuel for your morning yoga practice, or drink it as an antibacterial tea to ward off colds and flu, it is great for supporting post-brunch digestion and for warming your heart and uplifting your spirits when you feel sad or anxious. So imagine lying, post-deep healing energy treatment, and having one of our heart-felt assistants bring you a cup of tea and a smile full of empathy and understanding. Simply lie back, sip and receive and feel the nurturing warmth and the revitalising scent nourishing you in mind, heart and body!